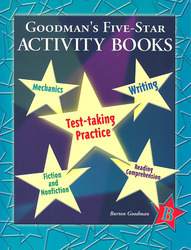 Goodman's Five-Star Activity Books reinforce and extend the themes in Goodman's Five-Star Stories and can be used in conjunction with that series or independently. Help students master the kinds of exercises most frequently found on standardized tests. Familiarize students with the kinds of questions they are likely to encounter. Develop competency in reading comprehension, mechanics, writing, and study skills. Provides readers with a wide variety of engaging, multicultural fiction and nonfiction materials.